The KRAIBURG Group » has established itself as a competent specialist in the rubber business since 1947. Since 1968 we have been developing and manufacturing rubber mats for animal husbandry in Tittmoning/Germany. Today about 200 employees exclusively concentrate on that. KRAIBURG today plays a leading role in the development and production of animal-friendly soft and at the same time robust high-quality housing floorings made of rubber for dairy cattle, young cattle and fattening bulls. Apart from our successful cubicle coverings we are especially proud that we were pioneers who worked intensively with walking alley floorings in cubicle housing systems. In collaboration with the University of Hohenheim we have developed the famous KURA product series. At our plant in Tittmoning/Germany we constantly aim to develop even better and more cost-effective products. In doing so, we always focus on animal health, welfare and comfort and with it the productivity of your animals as well as the longevity and durability of our products. With our PORCA product line we have introduced the first bite-optimized products for pig keeping on the market, which were specially developed for the use in farrowing pens. BELMONDO® rubber floorings are specially designed and produced for the application in horse keeping. BELMONDO® rubber floorings help you to promote animal-friendly stable management - increasing well-being, health and comfort! Furthermore they minimize bedding, costs and labour – leaving more time for your horse! Our name stands for quality ». 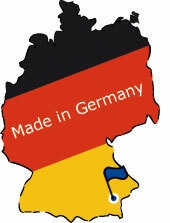 Manufactured in Germany our products will function reliably for many years. Our priority is to recycle high-quality raw materials by our unique manufacturing process! KRAIBURG raw materials consist of the best material from used tyres - which just provided for your safety on the road. Our unique recycling procedure was one of the TOP TEN best recycling ideas in the Pro-Sieben (German TV) science programme "Galileo"! While manufacturing KRAIBURG rubber floorings, we hardly produce any waste. Our highly-developed manufacturing process enables us to feed the offcuts from our tailor-made products back into the production cycle. Return guarantee for used KRAIBURG products: we will gladly take back used KRAIBURG products of solid rubber (except continuous rolls with fabric inlay) at our factory, if you want to dispose of them. Please contact us beforehand to make the necessary arrangements.